This is the third in a series of monologues being released as separate blogs. 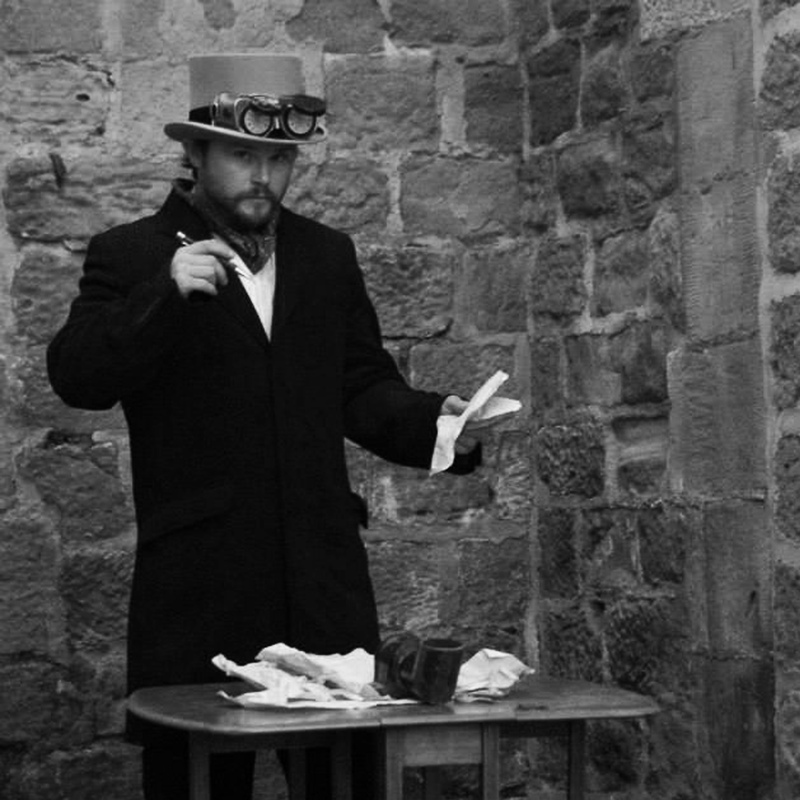 They form an account of an experiment performed at Knaresborough castle for Fright Night, Halloween 2013. Investigators travelled around the castle grounds to discover ghosts, who waited, hungry to tell their stories. As you read the accounts, I invite you to imagine that you are standing where the investigators stood, and having heard the ghostly tales, I challenge you to make the choice each experimenter had to make in light of the evidence given. Dare you read on? Are you willing to face your fears, your own darkness? Dare you step into the realm of the un-dead and unmask the vampire in our midst? To read the first account, Steven’s story, click here. To read the second, Elizabeth’s story, click here. The third account, John Henley’s story, was written in collaboration with Nigel Morgan, the performer who called him from the shadows. Who’s that? Who’s there? Be quiet! I have work to do, I’ve told you before, you will not distract me! Keep away from my files! Missing persons – six of them – all their details here. I have scanned them, searched them, scoured these papers with a fine-toothed comb. I have examined them until my eyes are sore and my head pulses with their mysteries. They have become my world, my obsession. Elizabeth. Heartbroken. Lost her sweetheart to war. Steven. Betrayed by his brother. Forsaken by his wife. Edward. Andrew. Ivy. And John – John Henley. I see their lives when I close my eyes. I hear their voices in the night. And you have come here to persuade me to leave? To break out of this cage? Never! I will not leave this place until I have discovered the secret of these disappearances. I will not be defeated! When I arrived, I had just returned from Africa. An investigator – the best – employed by the government to delve into mysteries. And I never failed. I never fail. I was posted here to investigate a series of unexplained missing persons. Placed in this castle accommodation, close to the disappearances, I was shown to my room and locked inside. I have been here ever since, trying to untangle this riddle, but it eludes me. It is as if I am blind to something that is right in front of me, something that is staring me in the face. There is no need for that lock on the door. I stay willingly, of my own accord! I am John Henley and I will not give up on this work! I will make sense of it in the end. You do not need to lock me in! I will not leave this room, not until the task is accomplished! But you have heard of my episodes, haven’t you? I can see it in your eyes. It is true that every day, just before sunset, I am gripped by the most ferocious rage, which I cannot explain, rage and then depression. It seizes me by the throat and throws me into a fit of violence and cursing. I hurl myself about this room, as if I am a rat, trapped in a cage. I bang on the door, calling to be let out, to be released from this cell. And then I sink into the deepest of melancholies. It consumes me from the inside. I am without light. In this state of delirium, the days and the nights merge into one. The noises in the castle mock me – footsteps and murmured voices. And the music. it will not stop! I do not understand where it comes from – the castle is a ruin. When I arrived it was void of life. The steward who showed me to my room – the man in the black coat – he informed me that there were, from time to time, other guests, but I have not met any, and would not wish to socialise anyway, not until my work is complete. You must believe me! After the depression, he comes again – the steward. He comes to my room to dine, and drains me of the anger and melancholy that flows in my blood. When I have been relieved of these afflictions and restored again to my rational self, I am able to continue with my work. That’s what I’m doing now, can’t you see? I will not be disturbed or distracted. These people need my help and I will solve their mysteries – Elizabeth, Steven, Edward, Andrew, Ivy and John – John Henley. Missing. Presumed dead. Now get out and leave me to my work! The steward will be here soon and he must not find you here. Make sure you hear the next fragment of evidence by following this blog. After the account, you must make your choice. danielingrambrown Born in East London, Daniel now lives in Knaresborough, Yorkshire, in a house built of stones from the town’s ruined castle. Author of the Firebird Chronicles series, Daniel also works in the field of performance and is currently Artistic Director of Suitcase and Spectacles Children's Theatre. He has led numerous community theatre projects that explore how stories shape us and what mark they leave on the places we live. Daniel is interested in exploring philosophical and spiritual questions in fun and engaging ways that inspire children to think and to wonder.